Come to Cape Auto Repair for expert maintenance, service, and repairs on Porsche Panameras at a great price. 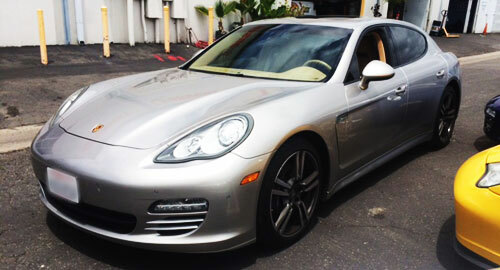 We run a full-service, independent auto repair shop in Laguna Niguel that specializes in all Panameras made since 2010, including the Panamera 4s, Panamera S E-Hybrid, Panamera GTS, and Panamera Turbo S Executive. Our owner and lead technician are both thoroughly trained by Porsche and have the extensive knowledge and industry experience needed to accurately and reliably maintain, diagnose, and repair your vehicle. They are dedicated to building long-term client relationships throughout Orange County and always happy to provide customized solutions for each client's specific needs. Whether you require a minor service or major repair, our prices are very competitive, and we'll take the time to educate you about preventative measures that can save you thousands in the long run. At Cape Auto Repair, our comprehensive service for Porsche Panameras includes pre-purchase vehicle inspections, oil changes, filter changes, diagnostic checks, scheduled maintenance, brake service and repair, suspension and alignment repair, transmission service, electrical repair, cooling system repair, engine repair, and more. We stay current on the industry's best repair techniques and the latest issues affecting the Panamera. We also offer a broad selection of OEM parts, high-quality aftermarket parts, and brand name fluids, so we are able to meet an array of personal preferences and budgets. Call Cape Auto Repair today for honest recommendations, expert service, and personalized customer care. We'll provide you with a written estimate and always call to you authorize further work. We offer pick up and delivery service as well as loaner vehicles, and back our repairs with a 12-month/12,000-mile parts and labor warranty. I have been bringing my '87 Carrera Targa here for service for the last 5 years, after Andial closed. The staff is very knowledgable and competent . . .